30 "X 40" X 2"
sold $9,000-Glastonbury, England, THE PAINTING lived in the Chalice Well for 5 years, today He hangs in the Archangel Michael Chapel in Glastonbury. Archangel Michael Spirit of Fire. His sword of light offers energies higher. His protection shield averts deception, to assist in a higher conception. As the New Age is dawning on the Earth, the Infinite One has commanded a reunion of the Angelic and Elemental Kingdoms to unite with humanity to fulfill and co-create in the Divine Plan. In respect to this call, the Archangels are appearing more to us, bringing Love and assistance to help us remember our heritage, the spirit of Light our Divine right. 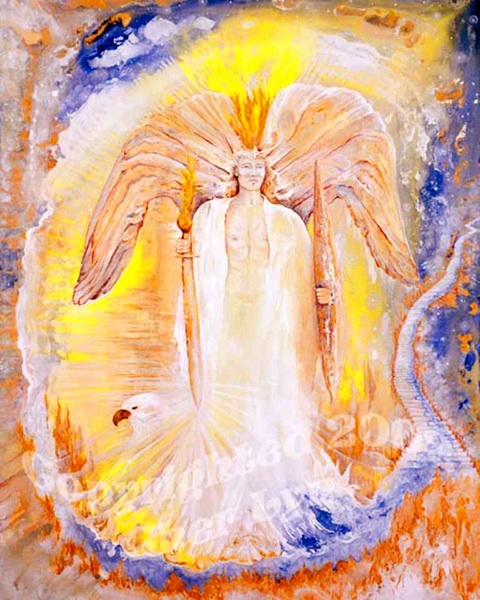 In the painting of ‘Archangel Michaels Fire of Transformation”, His aura/wings are golden light. You see an Eagle emanating through his sword of fire, for He no longer chooses to be depicted killing. His essence which is love, inspires consciousness raising and a deeper connection to your spiritual essence. The medicine of Eagle flies high into the heavens and moves easily between worlds, bridging earthly and spiritual power. He serves as the mediator and bearer of a new creative force. A Dove at the foot of His robe is the symbol of prophetic vision, balance and peace within the maternal feminine. The winged Pegasus splashing in the waves of consciousness lifts you into higher realms of awareness. A cosmic stairway guides you on your journey to higher perception. The transformational Fire blesses you as healing Waters flow, blessing from the heavens above, blessing as you go. In November of 2001 I made my first visit to Sedona, Arizona. Decade’s prior I had been told I would love Sedona and that my art would be well received. This was true. I had seen photos of the red rocks and unknowingly even painted them 1985, Red Clouds Story, but had no idea the magic I would experience by touching ground. Attending an 11/11peace prayer ceremony in honor of the 9/11 tragedies victims, I visited a beautiful retreat center at the base of Cathedral Rock, one on the most amazing and powerful vortex energy centers in Sedona. Only planning to be there for three hours, the “phenomenon play” invited me to paint the Archangel Michael. Drawn and inspired by this magical place, I worked a trade and stayed, while I began creating the painting of the Archangel, and in return they would receive a large Giclee’ print of what was to become the painting of Archangel Michael's Vision. Before my trip, I had noticed a palpable energy pulsing out the top of my head. And a very small, very bright light out of the corner of my left eye revealed itself to me in my waking state and in my dreamtime. This light was fascinating to me. What was it? What did it mean? I wondered if maybe it was a part of me waking up. I liked the idea! ~At the same time I was haunted every night in a reoccurring dream where I was bathing blissfully in the presents of the most amazing Light. And every single time, coming from my right side, a huge luminous shadow proud in its narcissist crept in and would consume all of my bliss. I would end huddled in darkness with many others around, but we all deeply believed we were punished, shamed and alone. As though I was remembering the moment of separation night after night, I just wanted it to stop. I met a woman who had written a book about Being Real. I observed her throughout the evening and at one point said to her, “it really looks like you walk your talk,” and I meant it. I could feel and see within her that she doubted my words for herself. As I looked at her I felt myself begin to spiral down with her. I realized something was happening within me that was resonating within me, and her self-doubt. It wasn’t the first time this happened and it was getting to the point where I was becoming afraid to look anyone in the eyes. I centered myself using strong intent. I continued to stand before her and beam as much love and understanding as I could. Then I went to the bathroom and cried in fear, not knowing what was happening. Back to 2001 and the tent in Sedona, sleeping next to Oak Creek. I had been meditating on receiving the compassionate love energies of Mother Mary infused in a rose quarts crystal skull. This was an out of the box experience for me. But I could not deny the peace I felt when I held it, therefore loving to sleep with rocks anyway, I accepted the invitation to sleep with the skull, Mary. Sure enough I had the reoccurring DREAM again. Only this time while in my bliss state, I felt the shadow of darkness appear again, coming from my right. I stopped and looked at it; hands perched on my hips and for the first time I spoke to it, annoyed in my tone, I said, “What? Why are you always ruining my bliss?” As my uttered the words, I was consumed with a very strong Motherly compassion with love coming from my very being. Opening my arms to an inner knowingness that this dark shadow simply wanted love, I embraced the shadow, bringing it to my heart and the luminous darkness transformed instantly into particles of Light. I was at once in bliss again, and the very small bright Light that was only in my left eye before, now shown in both of my eyes. PAINTING… As I prepared the space where I would be creating Archangel Michael, thoughts began to spark doubts. I had not attempted to paint an Angel before. I wasn’t brought up to believe in them, so again I found myself in subtle unconscious fear. How could I connect and paint an Angel when I didn’t really have experience of their existence? Will it be good enough? People will be watching me and expecting something, I have to perform. Trust, trust, trust! I figured it was like the concept of fairies for me; I loved the idea, yet in the past I never really believed they existed until they revealed themselves three dimensionally to me. I know for me beyond a doubt that Fairies are real, so why not Angels. Later that afternoon, I sat in meditation with Archangel Michael and contemplated his said duties of killing the evils of the world, as a warrior protector. I contemplated my dream of embracing the dark and I began to feel a deep connection to his Spirit and what he truly carries within his Being. I began to prepare the canvas in a ceremonial way through the use of vibration, sacred medicine, crystals and essences. The process was unusually different for me not being in my studio and periodically I really had to release the idea of my privacy I so treasure and flow in this new experience. I was inspired to use yellow, a color I rarely used, to discover yellow is the color that represents personal power, as is the color of our 3rd Chakra. Blue is the highest order of Divine Wisdom and integrity; here I painted it as the cosmos. He holds his sword of light that sheds no blood, a flame to burn through the illusion of darkness that lead us out of the lower world illusions that have beaten, pounded and burned us in the past. In his shield I used frankincense, incense that is of the highest vibration of any plant. Vibrations of Divine energy. Back in my studio in California, I was finishing Archangel Michael so I could get him photographed, and the reproduced giclee' print delivered to Michael's Vision back in Sedona. After, when I was complete the original hung in the Agape International Church in Los Angeles, when I kept feeling his Spirit call, telling me the painting was not complete. He didn’t let up and soon I brought him back to my studio and spent some time in meditation with the painting once again. Images began to appear that I hadn't seen before. I discovered what I was hearing and feeling was indeed true; Michael's Vision was not complete. He had to evolve into something that symbolically brought in more depth and meaning. I am eternally grateful when I listen to the voice of guidance inside me that leads me to discover the mystic's magic of Spiritual awareness.